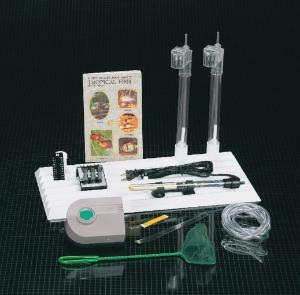 Set up your own aquarium in minutes with these complete starter kits. Designed to be used with any 10-gallon aquarium, this comprehensive set contain everything needed to start and maintain a basic Set up your own aquarium in minutes with these complete starter kits. Designed to be used with any 10-gallon aquarium, this comprehensive set contain everything needed to start and maintain a basic aquarium. Ordering information: Kit includes air pump, airline tubing (2 m), aquarium heater, thermometer, plastic gang valve, dip net, double-outlet diaphragm pump, Whisper™ Water Filter and aquarium handbook. Please note that tanks are not included with these kits.